Nate was wonderful. The music he played kept our guests dancing until the last second and everyone was so engaged from start to finish. He was wonderful and so resilient with guests requests. I would recommend him to anyone looking for a killer DJ and will always remember our special night with happy dancing guests...thank you Nate!!! Thanks for your kind review Katie! I had a great time Deejaying your fantastic wedding. I wish you a Mark a blessed marriage! DJ FastLane Nate is an amazing wedding and special events DJ. I have been to many events where he has Dj'ed and he knows exactly what to play depending on the mood. Aside from being amazing at his craft, he is also very kind and easy-going. 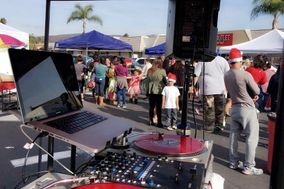 He is definitely one of San Diego's most versatile DJ's.